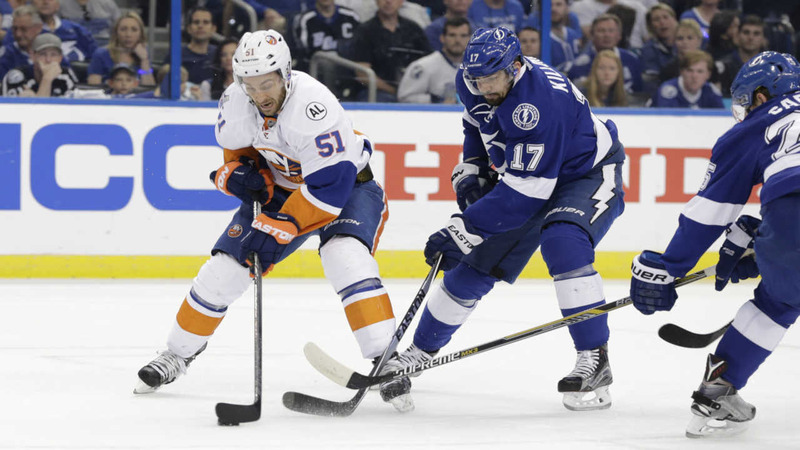 TAMPA, Fla. -- Victor Hedman scored twice and Ben Bishop stopped 28 shots Sunday, helping the Tampa Bay Lightning beat the New York Islanders 4-0 and reach the Eastern Conference final for the second straight year. Tampa Bay eliminated the Islanders in five games, winning four straight after dropping the opener of the second-round series. Hedman scored an unassisted goal from the slot at 13:49 of the first period, then beat Islanders goaltender Thomas Greiss again on a second-period power play that gave Tampa Bay a three-goal lead. Nikita Kucherov and Brian Boyle also scored for the Lightning, who will face either the Pittsburgh Penguins or Washington Capitals in the East final. The Penguins lead the Capitals 3-2 and Game 6 is Tuesday night in Pittsburgh.